Dr. Mody graduated Dental School 25 years ago and has worked extensively in private practice. He comes from a family of dentists, being the third generation to practice dentistry with pride and humility. Dr. Mody is highly skilled at Wisdom Teeth Surgery, most Oral Surgery, Laser Dentistry, Implants, Orthodontics, Dentures, Crown and Bridge work, Cosmetic Dentistry, Teeth Restoration, Root Canal Therapy and Periodontal Therapy. 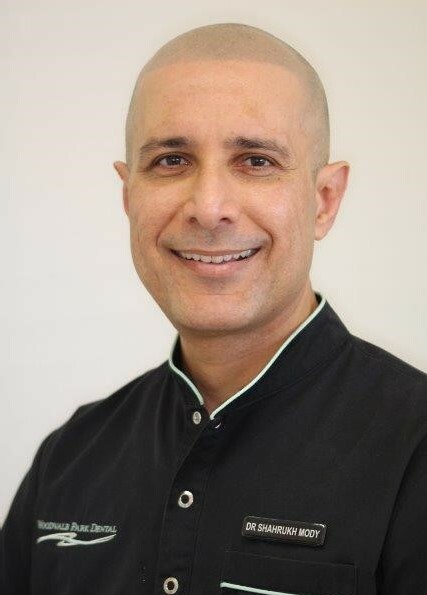 As a Dentist, Dr. Mody has a strong desire to provide quality patient care, and the exceptional skills to practice the most modern techniques in repairing, restoring and maintaining patients oral health. Throughout his career, he has been able to further these goals and gain a complete understanding of the demands and requirements necessary in order to practice exemplary dental techniques and provide compassionate patient care. He is committed to a practice that combines science, technology and aesthetics with personalised care. Dr. Mody has worked towards building a dynamic practice that values patient relations, honesty and strong ethics as well as continual advancement in dental techniques and patient care. Steered on by Dr. Mody, Woodvale Park Dental has gained a valuable reputation for excellence in affordable, aesthetic and reconstructive dentistry. When not at work Dr. Mody enjoys spending time with his family, working out at the gym, swimming and playing cricket. He is passionate about Music, Singing, Fitness, Nature Photography and enjoys outdoor activities. Woodvale, Kingsway, Edgewater, Kingsley, Whitfords, Hillarys, Duncraig, Joondalup, Mullaloo, Ocean Reef, Hocking, Padbury, Pearsall, Beldon, Sinagra.